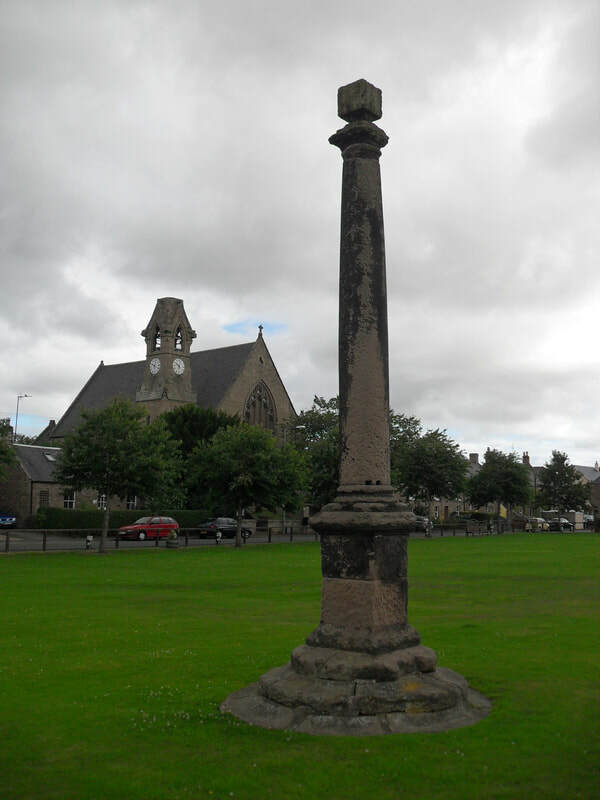 The column at Coldstream was erected to celebrate the victory of the Independent and Liberal Party in the 1830 election. The statue of Charles Marjoribanks was replaced in 1873 after the original one was struck by lightning. Part of the statue known as 'Old Charlie's Leg' is on display at Coldstream Museum. ​Marjoribanks was MP for Berwickshire after the Reform Act of 1832. The inscription says he was a man of 'high talents, amiable qualities and political principles'. The South Lodge entrance to Duns Castle was built in the early 19th century in an asymmetrical French Gothick style, probably by an amateur architect. Most of the buildings in Buxley, a hamlet attached to Manderston House, were designed between 1897 and 1900 by John Kinross for the owner, Sir James Miller, 2nd Baronet. ​The Dairy tower is dated 1900 and is in the style of a Pele Tower. The boathouse was designed by John Kinross for Sir James Miller in the style of a Swiss chalet, and built in 1894 to celebrate Miller's engagement to Eveline Curzon. In the gardens of Mellerstain House, there is a cottage orne. In the graveyard of Edrom Church is the Logan Vault incorporating the Norman Arch of the original church, which was rebuilt in 1737. The 12 feet high tower was built in the early 19th century as a watch-house to protect the graveyard from potential body-snatchers. The watch-house was built in the graveyard in 1849 using fragments of tombstones, some of which have elaborate carvings. The early 19th century square dovecote has battlements on three sides with stone cannon barrels projecting from the walls and blind crosslets on the north and east sides. It was used as a cart shed. It has now been converted into holiday accommodation called Nisbet's Tower. John Nisbet was a smuggler who built Gunsgreen House in 1753. In 1789, Hugh Hume-Campbell, 3rd Earl of Marchmont, 3rd Lord Polwarth, built a mock castle on the site of a castle that had been slighted by Oliver Cromwell in 1651. It was restored by Berwickshire Civic Society in 1985 and became open to the public in 1992. The ice house at Paxton was built in about 1765 and is in the shade beneath the arch of the entrance bridge. Entrances is an installation at Paxton House created by Julia Hilton in 1993/4 out of 6,000 bricks. She was inspired by the stages of an opening bud. Julia had trained at Edinburgh College of Art, and Entrances was initially sited there. It was rebuilt at Paxton by local stonemason, Marcus Paine, under Julia Hilton's supervision. Fish houses would once have been numerous on the banks of the River Tweed, where fish could be stored for a few days before being taken to market at Berwick and the transported to London. The boathouse on the bank of the River Tweed was built in about 1848. It was restored in 1995, and It is now a museum of salmon fishing at the Paxton shiel or fishing station. After the publication of Sir Walter Scott's novel St Ronan's Well in 1823, the healing properties of the spring water at St Ronan's Wells became popular. 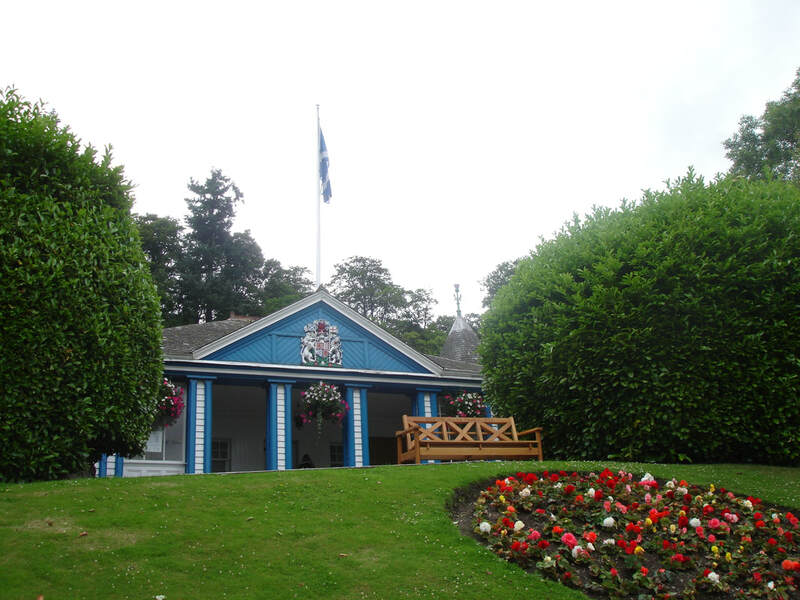 William Playfair designed the Wells Brae Pavilion in 1826 for the 7th Earl of Traquair. Wells Brae was reconstructed in 1896, and the Royal Coat of Arms added to the pediment in 1913. It was refurbished in 1991, and is now a museum. The gateway to Shedden Park is a Triumphal Arch erected in 1852 as a mark of gratitude for the gift of the park by Mrs Robertson in memory of her nephew, Lieutenant Robert Shedden. Sheddon died in the search for Sir John Franklin's team who were trying to find the 'North-West Passage'. The castellated Head Gardener's Cottage at Floors Castle dates back to 1815. The kitchen garden was laid out in 1857, under the supervision of Mr Rose. The little Pavilion to the east of the walled garden is all that survives of a line of glasshouses known as the 'Tropical Corridor' that had a 300 feet long path. An early 18th century doocot is attached to a 19th century byre range. The arched screen at Abbotsford House was probably designed by John Smith of Darnick in 1824 as part of Sir Walter Scott's Romantic landscape, and inspired by the cloisters at Melrose Abbey. In the East Court at Abbotsford is a turret built into the wall. The stone figure was presented to Abbotsford after Sir Walter Scott had died. It represents Morris asking mercy from Helen Macgreger (Rob Roy, chap. 31). The unfinished sculpture was by John Greenshields. John Smith of Darnick designed the castle-like game larder at Abbotsford in 1851. Inside is a wooden game hanging device in the shape of a pineapple. An underground passage connects it to the kitchen. At Sir Walter Scott's home of Abbotsford is a Gothic-style orangery that he designed with John Smith in 1823. There is a stone over the doorway of the large beehive dovecot at Mertoun gardens dated 1576, which makes it the oldest dated one in Scotland. The battlemented Stirling Tower, with projecting cannons, was built in the early 19th century for the 11th Earl of Buchan as part of his Romantic landscape at Dryburgh. The Orchard was planted by his own hands by the Earl of Buchan, in honour of his excellent parents. The Dryburgh Abbey Doocot is dated 1828 with the initials D. E. It was a component of David Erskine's Romantic landscape. The 20 feet high plinth and statue of Sir William Wallace in Roman costume was made by John Smith and was erected in 1814 for the Earl of Buchan. ​There is an ornamental urn nearby. This realm from Edward's iron yoke. In 1298, Wallace was proclaimed 'Protector of Scotland'. The Temple of the Muses at Dryburgh was built in 1817 for David Steuart Erskine, the 11th Earl of Buchan. It was built to commemorate the poet, James Thomson, who died in 1748. Thomson wrote 'The Four Seasons' and the lyrics for 'Rule Britannia'. A bust of Thomson is on the pinnacle of the temple and originally, inside, there was a stone statue of Apollo on a pedestal with nine muses. 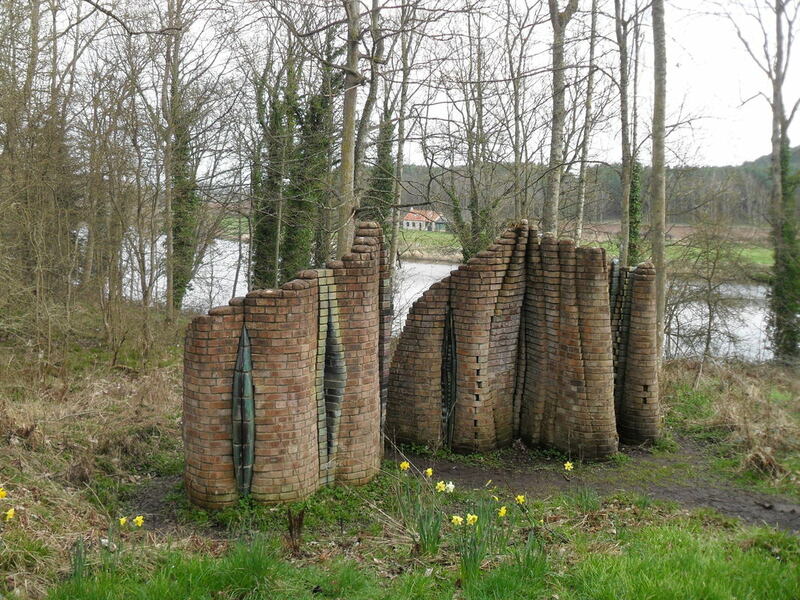 The modern bronze sculpture, celebrating Thomson's 'The Four Seasons', is by local artist Siobhan O'Hehir. William Adam built Hundy Mundy for the Hon. George Baillie as an eycatcher from his house at Mellerstain. 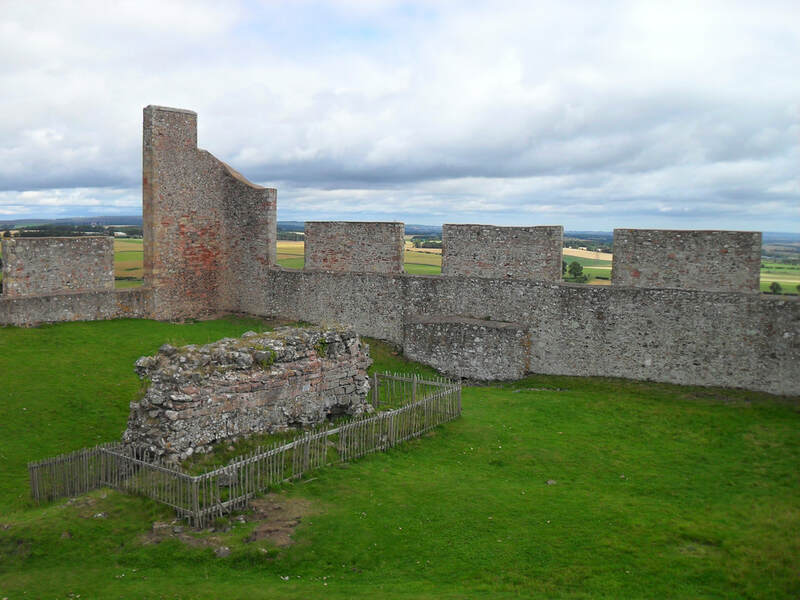 The stone is said to have been reclaimed from an old tower house on the site, which was occupied by a Pictish princess called Hunimundias. Alternative, the name may be a corruption of a classical Greek word. The 12th Earl of Haddington named a horse Hundy Mundy. The sandstone column on the village green is dated 1769. It is surmounted by a square finial with a carving of a boar beneath a tree, and sundials on the other three sides. The boar is the village symbol, and 'Swinetoune' takes its name from when wild boar roamed freely. The cross is now in the middle of a football pitch. ​The bridge at Traquair House was built in 1880 for Hon. Henry Constable Maxwell Stuart, the 16th laird. The sandstone gate piers were constructed to resemble brick and built in 1737, and the bears, carved by George Jamieson, were added in 1745. It is said that Bonnie Prince Charles was the last person to pass through the gates, and the Earls of Traquair have kept them closed until the Stuarts reign again. Another saying is that the 7th Earl closed them in 1796 when the countess died. 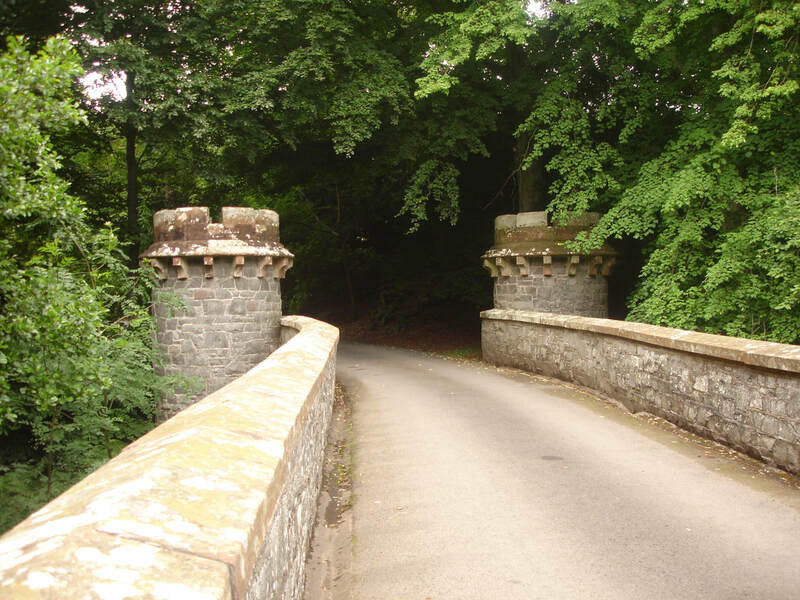 A Gothick arch spans the road to the now demolished Spottiswoode House. The archway is one of a pair; Bruntaburn Archway is about a mile away. ​Spottiswoode House was built in 1832 and demolished in 1928.